In 1986, Ola Mae Ransom’s son, a Vietnam vet who had been sprayed with Agent Orange, developed arthritis in the spine and an inoperable disk problem. He became unable to work. In search of services, she accompanied him to the Vietnam Veterans Center. There she observed groups of men sitting around for hours on end. When she asked a counselor about the situation he explained that the vets were homeless. With nowhere to go, they came to the center in the morning for coffee and doughnuts and then slept on the streets at night. Appalled at the public indifference to the plight of many Vietnam vets, Ola Mae mortgaged her own home, invested her savings and solicited donations to buy two duplexes and set up the Alpha Omega Faith Homes. On February 14, 1988, Alpha Omega Faith Homes opened the doors to veterans in need of a home environment and assistance in getting back on their feet. Since then hundreds of vets have passed through the doors and back into useful lives in the community. 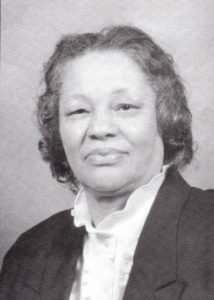 When asked about her motivation, Ola Mae says that she’s “done this work all my life.” Raised in Mississippi by her mother, who helped women deliver their babies in the fields, and her father and father and grandfather, who themselves worked with the homeless, she moved to Memphis and continued her family’s tradition of helping solve community problems. Ola Mae Ransom’s determination to address the plight of the Vietnam War veteran resulted in the founding of Alpha Omega, an organization that continues to serve veterans’ needs. And, she continues to invest her energy in improving our community.